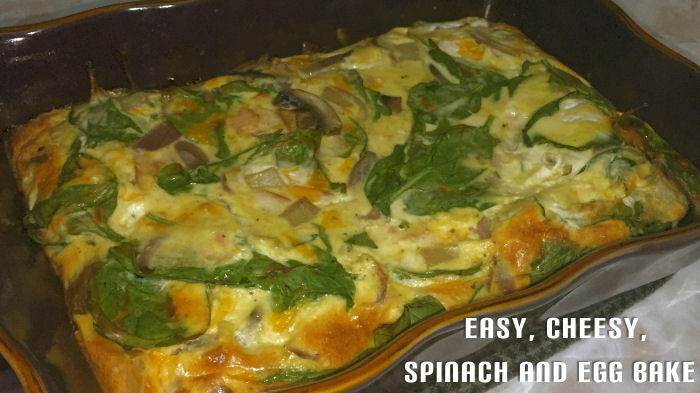 A quick and easy weekend breakfast or brunch. Great for a crowd or just a lazy day around the home! The great thing about egg bakes is that almost every ingredient can be changed up to suit your families taste. So go ahead, play around with veggies, seasonings…Let me know if you try this out or if you made any delicious changes! Preheat oven to 375° and spray baking dish. Dice potatoes, slice mushrooms, onions and shred cheese. In a pan, heat some oil and toss in onions, potatoes and mushrooms. Cook until potatoes are fork tender and everything has been nicely browned. Crack 8 eggs into a large bowl, set aside. Whisk until smooth and there are no lumps or clumps. Now gently whisk liquid mixture into the large bowl with your eggs. Once potato mixture is ready gently fold into your eggs along with your Deli Meat, 2-3 Cups fresh Spinach, 1 Cup Shredded Cheese, Old Bay Seasoning, Garlic Powder and Salt and Pepper. Gently mix together and pour into sprayed baking dish. Now's the perfect time to make your toast! This entry was posted in Recipes, Seasonal: Spring, Seasonal: Summer, Uncategorized and tagged baked eggs, brunch ideas, brunch potluck ideas, Canadian PR Friendly Blogger, cheesy egg bake, easy egg bake, easy egg recipes, easy spinach bake, egg bake, egg potluck ideas, eggs with greek yogurt, gluten free breakfast, gluten free brunch ideas, gluten free egg recipes, greek yogurt recipes, Hire a Blogger, potluck ideas, PR Friendly Blog, PR Friendly Blogger, pr friendly blogs, recipes with greek yogurt, recipes with herbamare, spinach and egg, spinach and egg bake, spinach and egg recipe, spinach bake, spinach egg bake, spring recipes, springtime recipes.